Size matters, particularly when it comes to user knives. This North Country EDC is a compact, hardworking knife that might easily find a place in your every day carry tools. 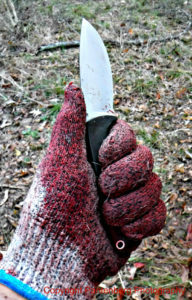 Disclaimer: Knivesshipfree.com and DLT Trading are Survivalcommonsense sponsors. I did not get a free knife, and I was not paid to write this review. All opinions expressed in this post are mine, and neither KSF, DLT nor Bark River have any input into this review. All I ever promise is a fair shake. The North Country EDC is a solid user knife. I also have a rigid blade knife, either on my belt, in my man purse and/or in my get home backpack in my car. My get home bag also has a machete in it. Initially, the attraction to the EDC was the design. I don’t carry user knives without generous handles, because I wear size large gloves and I want a solid four-finger grip. The blade design also must fit the intended task. In this case, I looked at the EDC and knew it would be a superior skinner. That proved to be the case. 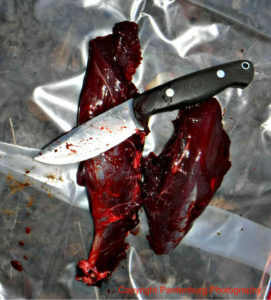 I skinned most of a deer with the EDC, and it worked really well, particularly around the front shoulders and neck. Handle: The handle is ample for my large hands. My palm measures four inches across, and I wear large gloves. I want a solid four-finger grip, because I may be using the knife for processing big game animals. The diameter needs to be big enough so my finger tips don’t touch my palm when I’m holding it in a hammer grip. The handle also has to work for several different grips, because you may use all of them. Handle ergonomics are paramount to me. If I can’t hold and use the knife safely and comfortably, I don’t care about the blade steel or the rest of the design. The micarta handle never got slippery. Handle material: You get your pick on the EDC – choose your favorite. Though my well-used Bravos all have beautiful wood handles (generally desert ironwood or curly maple), micarta is the best choice for a user knife. Micarta appears to be bulletproof. 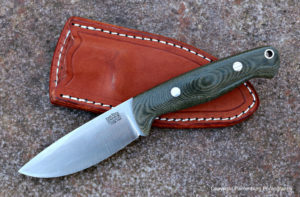 But the clincher is that micarta and wood get tacky and almost sticky when covered with blood, fish slime or the assorted goo associated with field dressing fish or game. You can’t go wrong with either choice. Incidentally, I’m not concerned about the durability of the wood handles. They were good enough for the mountain men and frontiersmen, and I’ve never had a problem with one breaking. In the off chance something does happen to your Bark River knife, it’s covered by the Bark River warranty. I didn’t get this knife completely covered in blood. But I was wearing cut resistant gloves over latex gloves that were covered in blood when I used it. No problem whatsoever with slipping. Blade design: The 3.5-inch blade is an excellent size for a deer hunting knife. It is large enough to do the gutting, but not cumbersome while working inside the abdominal cavity. It feels nimble in my hand. There is a nice belly from the point on back toward the handle, and this helps make it an effective skinner. If you want a knife primarily for slicing, you may need to look at a longer blade. Every hunter probably has a different opinion on the best hunting knife. I personally prefer a four to five inch blade on a hunting knife. The skill of the user, not the tool, determines how effective the knife is. Point: It’s hard to improve on a drop point in a hunting knife. The EDC point appears to be almost centered on the blade, meaning this knife could also be used to drill in wood. There is also little chance that the point will pierce the entrails when you’re preforming that first spine down, edge up cut to open up an abdominal cavity. Steel: I like CPM 154. It holds an edge and doesn’t appear to stain easily. The EDC was still incredibly sharp after doing some skinning and dis-jointing. A few quick passes on a plain leather strop restored the edge to scary, wicked sharp. The EDC works well in the field and the kitchen. Sheath: The North Country comes with a solid leather Bark River sheath that does a good job of protecting the edge and the user. Grind: Convex is king, as far as I’m concerned and I have proven to my satisfaction that the convex grind is superior to any other for my particular needs and usage. Cost: My EDC with a green canvas matte finish handle cost $187.45. This is a reasonable price for a semi-custom knife. If you want to customize the point or some other aspect, contact the BR people and discuss it. Chances are, they can modify the knife so you like it even better. The cost for such work is $15 for shipping and handling. I have had several of my BRs customized, and the results have been incredible! You will wear out much faster than this knife will and with reasonable care, the EDC could become a family heirloom and your grandchildren will be using it. Warranty: All Bark River knives come with a lifetime, 100 percent, satisfaction guaranteed warranty. The warranty is bulletproof and covers everything. Made in the USA: All Bark River knives are made in Escanoba, Michigan. The craftspeople make good wages, pay local, state and federal taxes and contribute to their communities. Do you need a North Country EDC? This knife could be your primary whitetail deer hunting knife, and it is a great choice as a backup knife. This knife will also appeal to people who don’t hunt or fish. The smaller size makes it easy to carry in a daypack or backpack, and it is light enough that it won’t get left behind at the trailhead. It can make feather sticks really well, and it can do a lot of wood carving associated with camping and bushcraft. The well-designed handle allows whittling or wood carving for long periods of time without developing blisters. I couldn’t find anything I didn’t like about this knife, and regardless of what hunting knife I am field testing, the EDC will likely be close at hand.